Vibration analysis is used to detect early precursors to machine failure, allowing machinery to be repaired or replaced before expensive failure occurs. All machines vibrate and have a 'signature' which changes as operating conditions change. Vibration analysis can help detect a wide variety of fault conditions. When a disruption in the vibration signature is detected, data is collected that allows workers to detect and assess the severity of fault conditions such as imbalance, misalignment, looseness, and bearing faults. It is most effective on high-speed rotating equipment. Vibration sensors can be the most expensive component of a PdM program to get set up and running, but it allows the user to evaluate the condition of equipment and avoid failures. 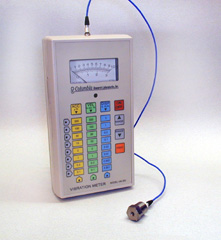 Typically these instruments comprise a transducer, data acquisition, and either a local display or some sort of output to a computer or other instrument. Vibration measurement instruments and vibration analyzers can accept a number of different types of transducers, including acceleration, linear velocity, proximity and displacement, rotary velocity, and temperature. In addition, many vibration instruments can take generic signal inputs, including voltage, current, frequency, and serial inputs. Some of these instruments can even accept wireless data transmissions. Acceleration sensors are small, easy to install, and have a large frequency (1-10,000 Hz), but they require integration to velocity measurement tools to measure acceleration and they are susceptible to shock and power requirements. In displacement sensors, the tip of the probe contains an encapsulated wire coil that radiates the driver's high frequency as a magnetic field. When a conductive surface comes into close proximity to the probe tip, eddy currents are generated on the target surface, decreasing the magnetic field strength and leading to a decrease in the driver's DC output. Displacement sensors are rugged devices and are a non-contact sensor but they have limited frequency range (0-1000 Hz) and are susceptible to electrical or mechanical runout. Velocity sensors are easier to install than displacement sensors but they are large, susceptible to calibration problems, and also have a limited frequency range. To convert one measurement to another the following chart can be used to calculate measurements. Four main features must be considered when selecting vibration measurement instruments and vibration analyzers accuracy, sampling frequency, and ambient conditions. The accuracy is usually measured as a percentage of the full scale of measurement, so an accuracy specification may be something like 5% or 10% instead of a hard number or range of values. Sampling frequency is how often the vibration instruments take readings from the sensors and should not be confused with measuring ranges of the sensors themselves. For ambient conditions, such things as temperature should be considered, as well as the maximum shock and vibration the instruments will be able to handle. This is the rating of how much abuse the devices can withstand before it stops performing, much different from how much shock or vibration the instruments can measure. As a complicated piece of equipment, vibration instruments can come with lots of other options that enhance their functionality or usability. Some of these are event triggering, self-calibration, self-test, built-in filters, and even capability to withstand extreme environments, such as those with excessive heat, moisture, or dust. Vibration instruments come in different form factors. As mentioned above, they can be stationary or portable. Another slightly different option is a handheld device, meaning that the instrument is actually small enough to operate in one’s hand, as opposed to being a portable device with wheels or a handle. Proper mounting of the sensors is very important. The sensor converts the vibrations into an electrical signal; therefore it must have a clear path of transmission. Sensors are most commonly attached using a magnet. The user interface can be as simple as an analog readout or as complex as an actual computer. Vibration instruments can be operated either manually or via a host computer, can have software support for computer interfacing, and can even have hard drives, removable media, or nonvolatile memory options. Electrical output options depend on the system being used with the vibration instruments. Common analog options are voltage, current, or frequency. Digital output choices are the standard parallel and serial signals. Another option is to use vibration instruments with an output of a change in state of switches or alarms. Vibration instruments can often output velocity or displacement values as well as standard vibration readings. Vibration measurement instruments must adhere to several standards to ensure proper design and functionality. For example BS ISO 18431-2 reviews mechanical vibration and shock signal processing and BS ISO 18431-3 describes the methods of time frequency analysis for vibration instruments. AGMA 94FTM9 is used for the analytical and experiment vibration analysis of a damaged gear. Accelerometers are instruments for measuring, displaying, and analyzing acceleration and vibration. Vibration sensors cover sensors and other instruments used for measuring vibration and acceleration.